This was an exciting week for my company Bon Education and our partner Curriki in the Middle East, as interest continues to grow in our efforts to create an Arabic version of Curriki–i.e. an open source platform that would house open source Arabic language curricula and learning objects created by teachers and education stakeholders in the region. “One of the things we know that improves teachers is for them to build their own knowledge, to get engaged in what they’re teaching,” Dr Kurshan said. Curriki, she said, encouraged teachers to get involved in the design and implementation of lesson plans, rather than simply presenting the content of a lesson without engaging the material. To the sharing of knowledge and curricula across borders, languages and professions! P.S. To learn more about Curriki’s curricula and teaching projects around the globe, watch this video. To tell a friend about the site and to give him/her access to the 32,000 free learning resources Curriki has to offer, click here. UAE Education Events You Won’t Want to Miss! The education scene in the UAE is very vibrant and in an amazing period of growth and productivity. I feel so fortunate to have an opportunity to learn from and contribute to the important education initiatives in Dubai and beyond. 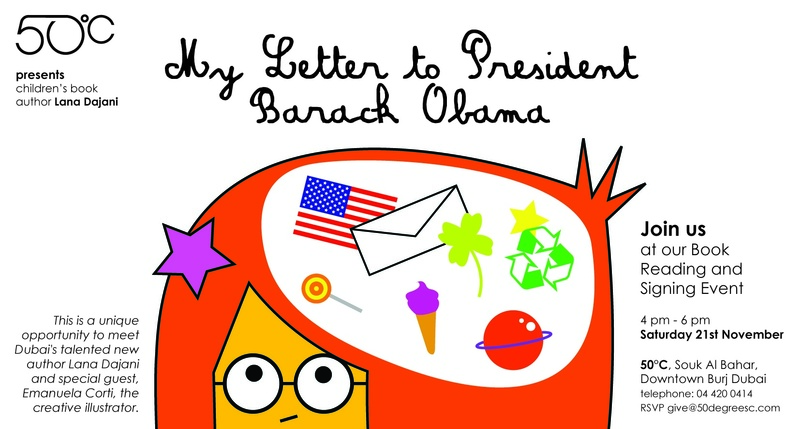 11/21/09 My Letter to President Barack Obama Book Reading and Signing Event. Location: Souk Al Bahar, Dubai, 4-6pm. Join children’s author Lana Dajani as she discusses her latest book, the environment and more! Illustrator Emanuela Corti will also discuss the delightful book illustrations. Download invite here. 11/22/09 Curriki on Nightline with James Piecowye. Tune your UAE radio to 103.8 (or listen online here) at 8pm. Learn about www.Curriki.org–a non-profit that provides free and open source curricula collaboration tools to educators across the world! Location: British University in Dubai, 10am-12:30pm. Download details and invite here. Learn about blogging, how blogs can be used with children, make a blog and meet other UAE moms to boot! Location: Magrudy’s Education Resource Center in Dubai, 9am-12pm. Read workshop details and register here. Learn how to breeze through future school projects and avoid homework time stress! 12/08/09 Mom 2.0: Digital Literacy and Cyber Safety: What Kids and Parents Need to Know! Learn how to help your kids interact safely and productively online! Can’t wait to see UAE educators and parents at the events above!